What are the odds of rain in July in Texas? Not likely. However, it’s raining, it’s July, and I’m in Texas. Nice quiet time to tangle! 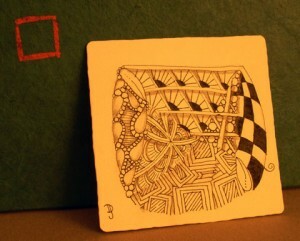 A Zentangle a day is as good as an apple a day. It’s helps get your brain relaxed and focused, and ready for the day. Just like yoga for your body, Zentangle is yoga for your brain. It’s meditative state often opens your mind to greater possibilities. What’s so wonderful about this art form is that you do not need to know how to draw. It is easy and fun. Enjoy this Zentangle that includes two of my original tangles: Sunray and Kardz. Want to learn how tangle? Join me for a workshop at Owl’s Clover on July 24!